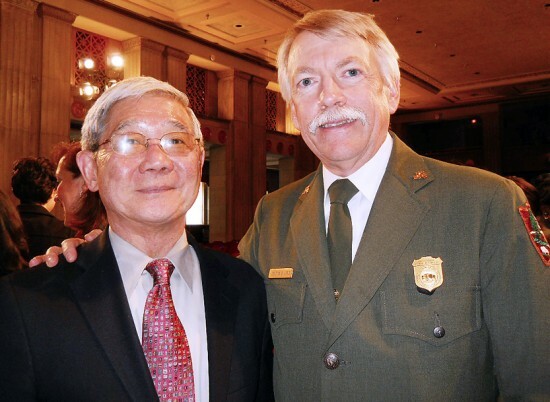 Dr. Franklin Odo, left, with National Park Service Director Jonathan Jarvis at the White House Forum on Asian American and Pacific Islander Heritage on May 9. WASHINGTON — Joan Shigekawa was a little girl when the U.S. government unjustly removed her family and other Japanese Americans to Tule Lake after the outbreak of World War II. Today, she is the head of a government agency with a budget of over $150 million. Although Shigekawa, acting chair of the National Endowment for the Arts (NEA), appreciates the irony of her paradoxical life path, on May 9 she focused instead on the deep pool of AAPI artists and scholars as she addressed the White House Forum on Asian American and Pacific Islander Heritage. AAPI artists, scholars, writers, and community leaders are destined to play a key role as the Department of the Interior and National Park Service (NPS) move forward on the Asian Pacific Islander Theme Study announced Feb. 10 by Secretary of the Interior Ken Salazar. The theme study is part of an overall effort by the Obama Administration to commemorate the stories and contributions of women and minorities that have been not been fully recognized in the past. The theme study and other materials will be developed over the next 18 months under the leadership of Dr. Franklin Odo, AAPI Scholars Panel chair and former head of the Smithsonian Asian Pacific American Center. Odo emphasized the importance of memory and consciousness in recognizing, preserving and interpreting AAPI heritage. Mineta noted that AAPI Heritage Month began in 1977 as “Asian Pacific Heritage Week,” based on a resolution he co-sponsored with U.S. Rep. Frank Horton (R-N.Y.). Mineta was a congressman representing San Jose at the time. • Portland New Chinatown/Japantown Historic District – This is nationally significant for its history as the largest and most intact Chinatown in Oregon. • Nippon Hospital Stockton, San Joaquin County – The Nippon Hospital is the last structure standing in Stockton that reaches back to the early 1900s when Stockton had one of the largest Japanese communities in the U.S.
• De Sabla Teahouse and Tea Garden, San Mateo – The garden is the work of Japan-born landscape designer Baron Makoto Hagiwara (1854-1925), chief gardener and concessionaire of the Japanese Tea Garden at Golden Gate Park in San Francisco. The Tea Garden and Teahouse were part of the El Cerrito estate owned by Eugene de Sabla, who was a major industrialist and co-founded the Pacific Gas and Electric Company. • Bromley Farm/Koizuma Hishinuma Farm, Brighton, Colo. – James Hishinuma, youngest of his family, felt it was his duty to fight for the U.S. during World War II. He joined the Army and was assigned to the 442nd Regimental Combat Team. • Tule Lake Segregation Center, Newell, Modoc County – Tule Lake was the largest and longest-lived of the 10 camps built by the civilian War Relocation Authority (WRA) to imprison Japanese Americans relocated from the West Coast under Executive Order 9066. • Little Tokyo Historic District, Los Angeles – The area known as “Little Tokyo” started as an ethnically mixed area populated by Chinese, African American, and Jewish ethnic groups. • Portland Buddhist Church, Portland, Ore. – The Portland Buddhist Church stands as an important reminder of the thriving Japanese American community once located in northwest Portland. It was the first Buddhist church founded in Oregon. • Mukai Cold Process Fruit Barrelling Plant, King County, Wash. – The Mukai Cold Processing Fruit Barreling Plant stands as a testament to the Mukai family’s dream of owning and operating a successful strawberry processing and packing business. • Castroville Japanese Language School, Monterey County – On the Central Coast of California, this small building served as a social, religious, and educational center for the local Japanese American community. • Angel Island, Marin County – A National Historic Landmark that served as the West Coast’s “Ellis Island” to hundreds of thousands of Chinese and Japanese immigrants. • Locke and Walnut Grove Chinese and Japanese Historic Districts, Sacramento County – Three neighboring Asian American communities established in the Delta Region of California by immigrant agricultural workers. Organized in conjunction with Asian American and Pacific Islander Heritage Month, events are taking place throughout the country along with observances of the 25th anniversary of the Civil Liberties Act of 1988 and 70th anniversary of the repeal of the Chinese Exclusion Act.